A copy paper is a paper product used to make a copy of an original document without using any electronics. The quality of copy paper directly affects the working efficiency of the copier and the appearance of text. 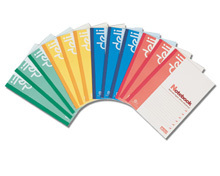 As a specialized copy paper supplier in China, we at Deli Stationery are able to provide copy paper of various specifications for your everyday copies. Our copy paper, which is dirtless, soft, and anti-static treated, will meet and exceed your expectations. I/NO Material Specification Packing Meas. As a China-based copy paper manufacturer and supplier, we provide customers with a great variety of office supplies, including notebook, paper shredder, calculator, glue stick, carton sealer, and more. Because our products are high quality and economically priced, they are in great demand by customers in the USA, Canada, Australia, Russia, Britain, Germany, Italy, France, to name a few. Thanks for viewing our website. We welcome you to contact us for more information regarding our office supplies.